Good thing there was something kind of an outdoor to look forward to and prepare for this year. So in preparation for our anticipated comeback to my once dream mountain (and now my favorite), Mt. Sicapoo, as scheduled on the last week of February, buddy Dennis organized a training climb for us-- this was the Rockies-Manabu peak twin dayhike. 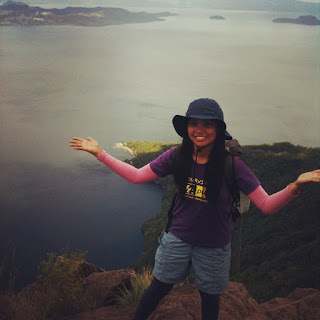 This happened to be my very first hike for 2013. I was wondering, what if there's no other reason except for training climb, would I still climb those 2 peaks again? In this twin dayhike, it was my fourth time in Rockies and my 2nd time in Manabu Peak. (When I was a newbie, I often told myself not to go back to a specific mountain, once it's already reached then there's no more reason to climb it again). Yet there are always new things to encounter and experiences to learn from. It's not only about mountain but about every moment that you experience and learn that matter. The climb event itself was new to me. This was my first time to do this combo climb. 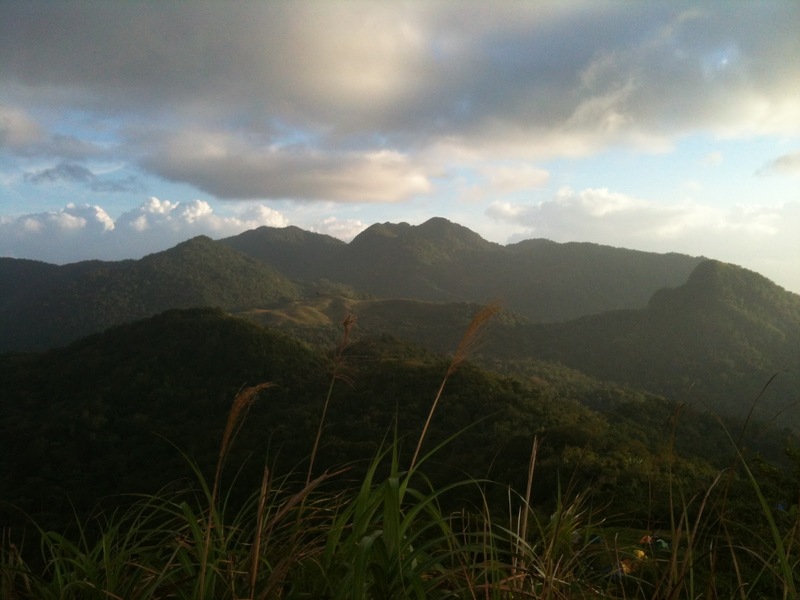 I've been to these mountains but in separate climb events (As you may notice in the list of all my past climbs). This double dayhike is popular to many hikers because of their proximity to one another in Batangas province. Rockies is in Cuenca while Manabu's jump off point is only few hours away which is in Sto. Tomas. Taking the Lemery-bound bus, our first stop was Rockies.There's a helpful and logical reason why it should be the Rockies to climb first instead of Manabu. It's because, at least even if you happened to finish by nightfall, tricycle may be rented in Manabu going back to Lipa for a Manila-bound bus unlike in Rockies in which beyond 5 or 6pm you can hardly find a jeep from Cuenca to Lipa. 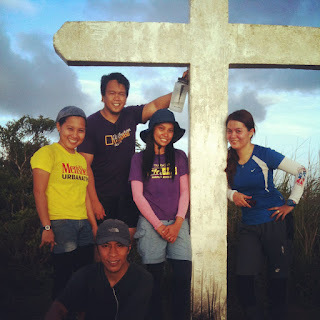 We were 5 for this dayhike-- Yeth, Ayen, Eric, Dennis and me. What surprised us was the new trail up to camp site. According to the locals there, the trail was only opened Monday last week. And such was the first weekend for the climbers to hike on the new trail. Same same! But I think it's shorter than the old one but a bit steeper. And the locals have already their respective place/station for their sales of buko juice or halo2x. There were many who climbed on that day including a big group from Sun power Binian. After some stand-by's and much kwentuhan at the campsite, we started to ascend to Rockies. In this fourth time to ascend through the mountain's rocks, I used to remind myself to take note of the rock awaiting straight anyone's head but when I'm already there I always forgot and so I bumped my head to it again. At the top of Rockies was the same amazement that I felt as I had on my first, second and third time there. The view of calm and serene Taal lake and surrounding mountains are breathtaking. In our descent it seemed that the trail caused me to slow down because of the loose soil and rocks that made it slippery to walk on. Perhaps it's due to the fact that it's not yet fully established. The soil is not held in tact and the trail is kinda messy Thankful to the stems of plants at the side of the trail in which we could hold on to and prevent ourselves to slide down. Right after we arrived back at the starting point, rains started to pour down and we were hesitant to proceed to Manabu Peak. My instinct was, it could not be raining there and it's better to proceed with this two-peaks dayhike as it is our training climb. Besides, the rain was tolerable , I think. It was also Yeth's first time to do such double hike. And so we took risk and transferred to Sto. Tomas through two jeepney rides and a tricycle ride. Hola sunny day! It was a very fine weather when we got there! I kinda revived myself from lots and lots of sleeping time during the rides. We prepared ourselves and began to trek. 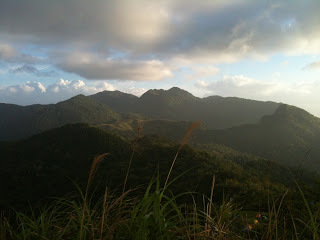 There was a great excitement in me going back to this mountain. The trail was very gradual at first and assaults can only be encountered before the kubo of Ka Perying. But he was not there (almost two years since he got his eyes medicated according to his brother who is now currently overseeing everything there) and there's still free coffee! According to him, he cannot make it a full coffee made of that from alamid (too costly) but instead is mixed with kapeng barako (a very popular coffee in Batangas). 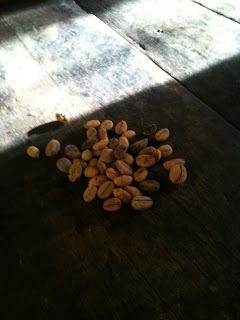 I was amazed when Tatay showed to us what the waste of alamid looks like and it's only like a normal coffee bean and not a pupu.A small bag of it is sold for Php100 and the bigger one for Php500. And those prices are already cheap because it is actually traded more than that price in the market. Finally we reached the summit marked by a white cross. We felt every second at the top. There was a good clearing except for the side which we were supposed to view Mt. Maculot. Apparently it's still raining there because it was covered by thick clouds. This was the first time I greatly appreciated Malarayat range. Manabu was part of it along with Malipunyo and Susong Dalaga. My first time here was a rainy trek and foggy at the top. We were also able to view Mt. Mt. Cristobal and Banahaw on the other side (Quezon province). And whaaat? We forgot to bring head lamp. I actually brought one for this dayhike but I left my bag at the jump off point including the head lamp. Hurrily we descended and arrived back at the starting point already nightfall at around 6pm. I was amused at myself because in this very first hike for the year, it appeared that I still behave like a newbie mountaineer who is very joyful and excited. It felt like I'm hiking for the first time and it really felt good. The passion will always be there, I guess.